Share the post "Album review: CHRIS BRAIDE – Fifty Dollar Planets And Twenty Cent Stars"
Towards the end of 2012 Chris Braide and Geoff Downes released an album that may forever be termed “one that got away”. DBA’s ‘Pictures Of You’ was arguably one of the best albums of the year combining sublime pop rock sensibilities and all highly accessible. Few will have heard it. Few will have heard of Chris Braide. He has an interesting songwriting pedigree, working behind the scenes for artists like Kylie, Beyonce and Britney Spears. More recently he was a member of The Producers with both Downes and Trevor Horn. ‘Fifty Dollar Planets…’ is his opportunity to step into the limelight although it’s his third solo album. Born in Cheshire, he decamped to LA towards the end of 2010. Braide emerges as a stellar pop rock craftsman on tracks such as ‘Beautiful’, ‘Let Me Love You’ and ‘What’s Going On In Your Head’. As a performer he reminds me of a rockier, less sugary, Richard Marx in places. He cites such influences as Squeeze, XTC and Prefab Sprout all of whom tap into that core of classic pop songwriting. Something is made in the blurb of a strong T-Rex/Marc Bolan influence but this only appears to be evident in the title track. With most tracks supremely radio-friendly, Braide has a chance to stretch out on the longer ‘Agent Wilde & The Speedway Dancers’ which is another standout. 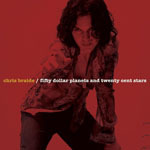 This entry was posted in ALBUM REVIEWS, ALBUM REVIEWS (Mobile), All Posts and tagged album, Chris Braide, DBA, Fifty Dollar Planets And Twenty Cent Stars, Geoff Downes, pop, review, rock, songwriter, The Producers. Bookmark the permalink.